The following is primarily based on a book that was written by Reverend D. F. Lamson. He was the town historian and a strong figure in the community as a whole. He was not born in town, but moved here later in his life. He was a graduate from Brown University and a reverend for the Baptist Church. The book was published in 1895. It is known as the most complete history of Manchester from 1645-1895. Unfortunately, there are limited copies available. 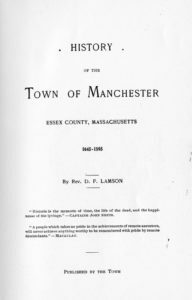 The quotations below are from Lamson’s History of Manchester, Mass. 1645 – 1895 and are accompanied with the appropriate page numbers. As the book was published in 1895, there are a lot of ideas and wordings that are indicative of the time that would not be appropriate in this time period, especially towards racial minorities. It is also important in viewing the author’s bias concerning the relation of events. In some instances, Lamson attempts to make the town seem more progressive. For example, he notes that slaves acted more like “indentured servants,” but then relays information concerning the mistreatment of African Americans. 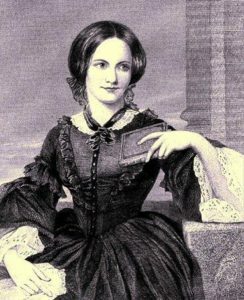 At the age of 18 in 1630, Anne Bradstreet traveled to the colonies with her family. With her on this voyage were two other visitors of note: her father, Thomas Dudley who was one of the governors of the Massachusetts Bay Colony, and her husband, Simon Bradstreet, to whom she was wed two years prior to arriving in the New Word. Simon served as the last governor of the Massachusetts Bay Colony. The family came on the Arbella, stopping for about two hours in the town before it had been formed on her way to Salem from England. She is remembered as America’s first poet. She was not mentioned in Lamson’s edition, but her father and her husband were. On their way to Cambridge to unite with the rest of the forces, members of the Continental Army from Virginia spent some time in Manchester. They camped by the parsonage at the time. They were fed by the people of Manchester, and, in return, entertained the crowd around them with their skill in throwing tomahawks. Similar to Douglass, Garrison also visited Manchester as a guest speaker for the Manchester Abolitionist Society. He was also an abolitionist, journalist, suffragist, and social reformer. He was the editor of The Liberator, and ensured that the newspaper’s weekly installments were sent to government officials. More information concerning the Manchester Abolitionist Society may be found later in the presentation. The Marquis de Lafayette was essential to America’s victory in the Revolutionary War, securing French aid to American troops. In 1824, Lafayette returned to the States to tour the country, observing the impact of the Revolution. 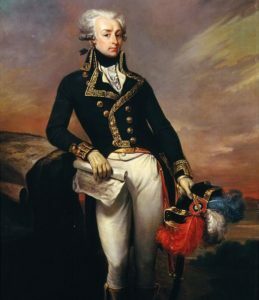 Lafayette did not actually come to Manchester, but he did come to the bordering town of Beverly where he made an address. 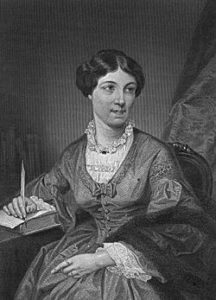 Harriet Martineau is known as the first female sociologist. In addition, she was a British social theorist and an early feminist. Upon her visit to Manchester in 1835, she stated that the town’s Smith Farm “is enough to make a poor man envious” (191). It is noted in the book that before 1760, slaves acted more as “indentured servants;” however, this demonstrates the author’s bias. In 1761, there were at least 30 slaves in the town. One event in which one slave, Pomp, disrupts the church service by making humorous faces. He was reprimanded heavily. Despite this, in 1775 a lecture was held entitled “The Beauties of Civil Liberty, and the Horrors of Slavery.” After this time, Lamson states that there were no slaves as taxable property. If the author’s bias is included in this statement, it is not clear. However, in 1790 there were no slaves in the Massachusetts state census as the state was becoming more progressive. By 1800, Massachusetts was seen as a booming state for abolitionists. While many Manchester residents of yesteryear had a progressive outlook on freedom, there were some exceptions, as always are in a fairly large group of people. The presence of the Whig party in Manchester prevented many Anti-slavery votes to be passed. Oftentimes, these votes consisted of declaring the town’s opposition to the actions of the federal government. The actions of Major Lee also went against Manchester’s rather progressive policies. 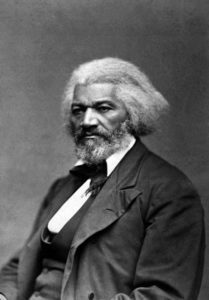 It is noted that he had slave cells in his attic. This violation of human rights most likely did not continue into the nineteenth century as in 1790 there was no record of slaves in the Massachusetts state census; however, it is still important to recognize the negative aspects of society in order to recognize the struggle of African Americans and slaves in that time. When the Fugitive Slave Act (1850) and the Kansas Nebraska Act was passed, the town of Manchester exhibited their displeasure through town meeting. In 1853, they voted that they “view with alarm and indignation [the] attempt of the slave power to enlarge the area of slavery, by the violation of compacts and trampling on the rights of man” (169). This statement, along with others, was sent to Manchester’s Representative in Congress, Charles W. Upham. Two Manchester residents were present and essential in the time that is known as Bleeding Kansas. The first of these men is Samuel Forster Tappan. He went to Kansas in 1854 and became the Alderman of Lawrence, Kansas. He served as the Secretary of the House of Representatives and acting Speaker of the House, Clerk of the House, and the Secretary of two Constitutional Conventions. He was against the Kansas Nebraska Act which dissolved the Missouri Compromise. Later in his life, he held Colorado for the Union. This insured that the confederacy would not get western footings. The second of these men is Lewis Tappan. In 1857 at the age of 26, he served as the Secretary of the Senate under the Topeka Constitution. He was also one of the 15 men who captured the box concerning altered election returns in Lecompton. As Kansas had become the first state to use popular sovereignty when deciding the stance of the state on slavery, many people known as “Border Ruffians” were bring brought into the state in order to alter the election. They would vote Pro-slavery in Kansas. The difference between the Free Soil Party and abolitionists were that the Free Soil Party places more importance on creating less plantations to bring more jobs up North and less on moral opinions. Abolitionists were focusing on ending slavery for moral reasons. 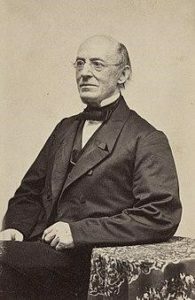 In 1853, the Town of Manchester elected Richard H. Dana Jr. to the Constitutional Convention with a clear majority under the Free Soil Party. The Whig Party and the previous Democratic Party ran a different candidate and were displeased with the election results. 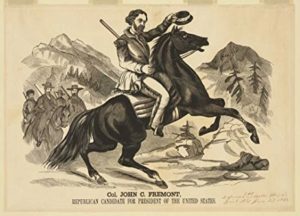 The Free Soil Party also appears in the town on September 11, 1856 where there was a gathering at Gale’s Point to promote Fremont’s presidential campaign. Over 8,000 people attended. The Anti-Slavery Prayer Meeting (also known as the Manchester Abolitionist Society) is remembered as being “one of the most singular prayer-meetings formed in Manchester or anywhere else” (172). These people were separated from polite society. Their meetings were used as an outlet for public discussion. It was under this group that many key abolitionists came to Manchester to speak. Among these were Frederick Douglass, William Lloyd Garrison, Lucy Stone, and others. The group was later absorbed into the Republican Town Committee. With the discovery of gold, many citizens of Manchester traveled west. The Liberator was used as packing paper, most likely by members of this society. While in the Deep South, this packing paper was caught by a gust of wind, scattering the papers. The citizens were informed that “such an offence must not be repeated” (151) It is noted that “The Southern constitution was too sensitive and irritable to bear so powerful a blister” (151). 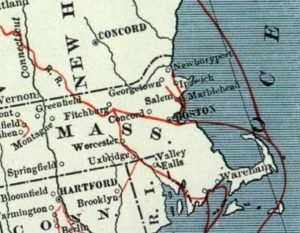 While trying to connect to the next stop in the Underground Railroad in Salem, an escaped slave missed the stop and traveled to Manchester. It is noted that: “There was one home to receive him, there was one friend to help him: wet and cold and trembling, he took him to his own house, fed, warmed and clothed him” (173). These “friends” were Daniel W. Friend, Delucena L. Bingham, and Thomas W. Gentlee. The men took a day to collect funds for the escaping slave and brought him to the next station two days later. The now escaped slave was heard from some time later safely in Canada. Manchester sent 159 soldiers to fight in The Civil War. This is out of 436 voting individuals (This number does not include women as female suffrage had not yet occurred.) and 310 residential houses. This amount makes up roughly a third of the voting populous. On April 11, 1865 when it was declared the war was over, the citizens of Manchester celebrated the Union’s victory. This celebration was rather short lived as devastation struck the town on April 15, 1865 when word came that President Lincoln had been shot. The next Sunday, there was a service at the church and all of the businesses were closed. When Boston was under British control, “she went there on foot, eluded the sentries, procured a supply of pins and needles, of which there was a distressful need, and made her way home to the great joy of the housewives who had been using thorns for pins, and whose stock of needles had become wholly exhausted” (326). With today’s roads and infrastructure, it is estimated that the journey from Manchester to Boston would take about 8.5 hours; however, Mrs. Samples Craft’s journey would have taken significantly longer as she had to reach the city undetected. As she would have gotten tired on the way back, this would take a large amount of time, speaking to Mrs. Samples Craft’s dedication towards bettering the lives of the residents of Manchester. This event most likely took place during the Jefferson Administration, possibly between 1800 and 1810. In 1810, this would make Daniel Leach 19 and Captain Tuck 70. At this time Leach had not yet earned the captain status. The vessel that the two, with the rest of the crew, were on was captured by English forces and brought to Halifax, Canada. Captain Tuck was known for his way with words and was able to quickly ingratiate himself with the English captain. When the new captain went ashore, Captain Tuck accompanied him. During their absence, Leach took an axe and broke open the arms chest. The English crew, busy with derigging the ship, did not have enough time to grab their weapons. The Americans swiftly regained control of the ship. When Captain Tuck and the English captain returned, Tuck was told that the ship was now under his control. The ship then returned to Massachusetts to Boston harbor. Captain William Pert also had a similar experience. When he as near Boston, he was captured by an English cruiser. The crew attempted to bring the vessel to Halifax; however, the winds were rather light. As the crew were not familiar with the area, the requested the Captain Pert take the helm. It was clear that with the light winds it would take a significant amount of time to reach Halifax, the English crew went below deck and entertained themselves with the plethora of wine and brandy that Captain Pert was transporting. It is noted that Captain Pert, on occasion, “had time to go below, and added zest to the festivities of brandies and wines, which were greatly relished” (87). Come night the winds were much stronger and Captain Pert was alone on deck. He turned the ship around and brought the ship back to Boston Harbor. When the English crew emerged from below deck (severely hungover), they were told that they were not prisoners. When a British frigate was spotted off the coast of Manchester, the alarm was given the militia gathered in front of the church. The sole cannon was loaded with the sole cannonball and the militia headed towards Kettle Cove. The militia rowed out to Crow Island where, hidden in the rocks, they began to raise morale by playing drums and hollering loudly. The frigate, expecting a larger force, retreated. The militia, ecstatic that they managed to repel the British troops, rush towards town where, at the bottom of the hill they had just climbed, they find their sole cannonball sitting on the ground. Fortunately the British frigate had not attacked as the small militia would only have a minimal amount of ammunition and were without their cannonball. 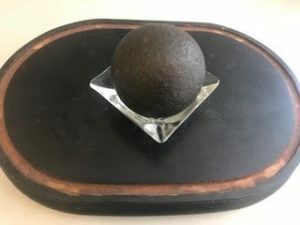 The Manchester Historical Society is currently in possession of the misplaced cannonball. Not much is said of John Dodge except his exceptional ability of having the strength to pick up seven 56 pound weights with his teeth. He was also able to dock boats at night by listening to the different reefs. His knowledge of the New England coast was extensive. Cheever was another interesting person in town. He told fish that were caught not by biting the hook, but by being snagged by it someplace else that: “You are the victim of an accident; I cannot claim you; go in peace” (328). One day when returning from fishing, he encountered an angry bull at Smith’s Point. He sat down on his barrow and began to speak to the bull in Scripture texts. The bull eventually left. In 1884, in order to combat the growing rattlesnake issue, the town offered a bounty of $1 per head of rattlesnake. In the economy of 2018, this amount would inflate to roughly $25. The majority of the snakes were located near the Essex line; however, there were snake dens as close to the town as Powder House Hill. There were rather minimal injuries as a cause of the rattlesnakes. 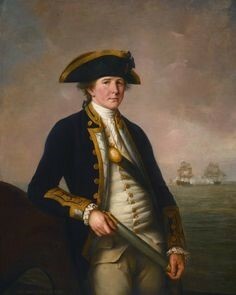 In 1799 Captain Henry Lee was bitten and saved through treatment. A few years later, Ebenezer Tappan was bitten. He survived the bite; however, at the same time each year the spot in which he had been bit would become discolored, inflamed, and lame until the time of his death (40 years later). In order to treat the snake bites, fresh earth, baths of warm milk, and the pelts of recently deceased sheep were used. Manchester’s rattlesnake issue was resolved nearly singlehandedly by John D Hildreth. Referred to by Lamson as the “Slayer of Dragons” (353), Hildreth caught rattlesnakes for the town, various museums, and to harvest the oil which was seen as a possible cure to rheumatism. Hildreth used two techniques to catch the snakes. In the first, he would bring a dog with him into the woods. The snake would pounce towards the dog, and Hildreth would catch the snake’s head in a slip noose attached to a stick. The second technique was used in the winter months. While they were hibernating, he would light a fire at the entrance to their den. The snakes would come out, and Hildreth would flip them over into the snow. As they are cold blooded, they require a heat source to stay alive. By throwing them into the snow, they would have perished. Hildreth dies a year after the town implemented the bounty on the rattlesnakes in 1885. On August 27, 1836 at 3 AM, a large fire was discovered at the Steam Veneering Mill of John P. Allen. The cause was a spark from the machinery that had fallen into a pile of mahogany dust. 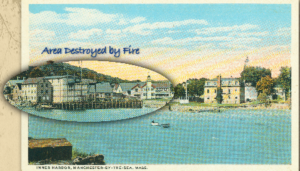 Easterly winds quickly spread the fire across town, resulting in extensive damages. Over 100 men were unemployed and many lost everything they owned. Allen lost $60,000 worth of property consisting of his two cabinet shops, a barn, and his dwelling house. He was only insured for $9,000. The cabinet factory of Mr. Larkin was also destroyed. Both Asa Story and Solomon Lee did not have insurance and lost a dwelling house, barn, and outbuildings worth $2,500 and a dwelling house and barn respectively. One of the reasons that the fire was able to spread so far undetected was due to the dense fog that had creeped in. The phenomenon known as “The Dark Day” or “The Yellow Day” occurred on May 19, 1780 and stretched from New England to eastern Canada. There is a bit of confusion centered around the cause of the event. Scientists and historians are certain that it was not due to a solar eclipse, a large cloud, a volcanic eruption, or a meteorite. It is hypothesized that it was due to a combination of rampant forest fires and a thick fog. 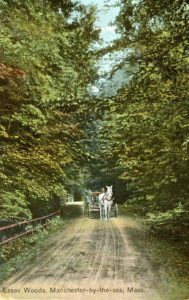 There are accounts of the smell of smoke in Boston and evidence of widespread fires in the trunks of trees from this time. Focusing on Manchester, it is said of Edward Lee that: “When the darkness came on, the neighbors all flocked around [him] begging his prayers. While every face but his was pale with fear, he was as happy and joyful as ever” (92). 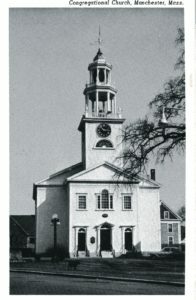 Lee was a strong figure in the Methodist Episcopal Church. He was a layman who was able to hold meetings for prayer. As Reverend Tappan had passed away 13 days prior, the church members would have flocked to him. Lee’s nephew remembers that “He got as near his good uncle as he could, and then thought, if the judgment day had come, he was safe” (92). Like any other town, citizens of Manchester feared what could be hiding in the forest surrounding the town. It is stated that: “Some being lost in the woods [at Cape Ann] have heard such terrible roarings as have made them much aghast, which must be either lyons or devils, there being no other creatures which used to roar” (91). The animals in the woods included bears, wolves, and rattlesnakes (which are noted as a mere “annoyance” (57)), but there were no animals at that time that were known to roar. This inflicts in us the slightest bit of fear that one walking in the woods centuries ago would feel. The people of Manchester centuries ago were focused on the supernatural. It was believed that there was a ghost present on the Gloucester road, and the supernatural was blamed whenever something strange happened (i.e. missing objects, the lack of seaweed from the shore before a storm, etc.). Manchester did have a woman who they called a witch by the name of Molly Sennitt. Not much was said of Sennitt other than an event in which a group of young boys dumped a bag of cats into her house, thus “letting the cat(s) out of the bag.” While they did not face issues with the law enforcement, the town elders did reprimand them. On January 12, 1791 the church voted “That Mr. Ariel Parish Baptize all Children who Shall be offered upon what is Called the Half Covenant” (230). The half-way covenant would allow children of baptized but unconverted church members to become baptized, thus becoming church members. This allowed them to vote. There was a bit of controversy surrounding this concept, causing the creation of various sects of Christianity. Despite this, it was a common practice of the 1600s and the 1700s. Sunday school in Manchester, founded June 24, 1810, was one of the first in New England. Founded by Harriet Newell and Ann Hasseltine Judson (known for their work as missionaries in the East), Manchester’s Miss Eliza Tuck, Mrs. Martha Lee, Miss Mary Bingham, and Miss Abby Hooper quickly took the lead. The key years of the school were from 1837 to 1843 where the high average of attendees was 355 people. The age range spanned from 3 to 80. Sunday school classes are still held in Manchester. In America, the temperance movement began in the 1820s. In 1829, the Temperance Society was founded in Manchester, and by 1836 it had roughly 400 members. In 1833 the church issued the following statement: “Whereas the use of Ardent Spirits has been the fruitful cause of numerous evils, which admit of no remedy but that of total abstinence, and as it is the incumbent duty of the churches to maintain a high standard of the Christian morality, it will from this time be required of all persons presenting themselves as candidates for admission to this church, to abstain from the use of Ardent Spirits in all its forms, except as medicine” (234). This is reflective of the society at the time. Prior to the purchase of a church stove, churchgoers had limited protection from New England’s harsh winters. As shown below, footstoves were used. 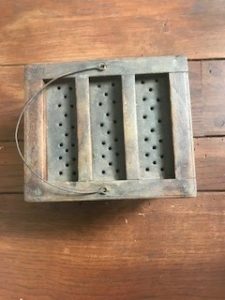 Despite their ability to keep one warm, they were only used by women as it was feared that they would “render the young puny and effeminate and endanger the health of the congregation.” (243). 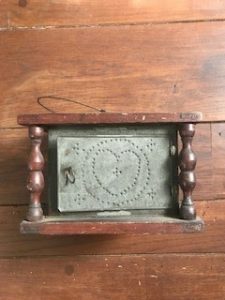 In 1821, to the displeasure of many, the church finally purchased a small stove. The next Sunday, two young women fainted due to the “baked air” (243) and had to be relocated in order to recover. The next day it was revealed that the stove had not been lit (as the wood had not been received), and that the two young women had merely pretended to pass out in order to remove the stove. 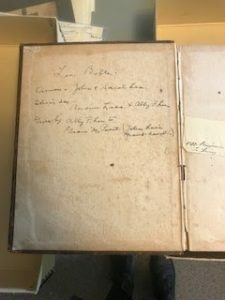 The oldest Bible in town previously belonged to the Lee family. It was printed in London in the year 1599. It is one of the oldest Bibles in the country. On February 10, 1724, it was “Voted that ye town should be taxed ten pounds yerely fower yers next insuing for the support of a free scool in sd town and no more then ten pounds a ere yerely ye sd fower yere to ye sd scool which is for all sexes for Reading & Writing Englesh and for sifering that belong to the town of manchester” (206). In this time, the town required free public education for all genders. This was primarily to ensure that they were able to read The Bible. This same language was used in 1785. On July 8, 1757 it was decided that “The present Selectmen shall Draw From the Town Treasurer What Money they shall think needful to Joyn with other Towns and Lay it out in such a way and manner as they shall think most Likely to Destroy those Devouring Wolves with are in or may be found in the Woods between Ipswich Gloucester Manchester Beverly and Whenham” (57). This was to combat the wolves that resided in the forests surrounding the town that would attack farm animals and, on occasion, people. An interesting note is that Lamson states that they are no longer wolves in the town. However, as times change, it should be noted that the wolves have returned to Manchester. In present day (2018) there are wolves, coyotes, and “coywolves” that reside in the woods and attack small domestic animals. On May 23, 1775 it was “Voted that if Mr. Daniel Presson shall refuse to watch or do his turn in Watching that He will greatly Incur the displeasure of the Town” (73). As tensions between the British and the colonists became evident in April of 1775 when English troops stole various items from the military stores in Concord, Presson’s misgivings opened the town up to attack. From the viewpoint of modern day, it is rather humorous that the town voted on the fate of one mere person, especially as about 23 people would have voted.